The original bronze, ‘piston’ type seacocks found on most Impalas are clever fittings which, when closed, seal the hole flush (no pun intended) with the hull. If you’ve been having trouble finding spares, don’t despair – they’re still made. They are known as the ElancoSeal, and, amazingly, still made by a firm in Norfolk – Landamores – who supply spare parts and seals kits. They’re well worth keeping going, as blanking off the through-hull fittings has to have an effect on your speed. “Hull Seals should not be left open permanently. They should be operated regularly to ensure they remain free. Annually or when hauled out, loosen grub screw in cap, unscrew cap and remove valve from body. Check for signs of corrosion of the stainless shaft, particularly where it joins the plunger. Grease shaft and thread on plunger and re-assemble. If necessary, replace shaft (3/8″ diameter 316 stainless steel rod). James Morrison (Reaction) reports that he has had problems with leaking seacocks – the original Elanco models. On inspection they seemed to have worked loose from the fiberglass. He has replaced them with a bolt-through design. I have asked James to send me photos or even the old seacocks so we can see if this is something we need to worry about. ElancoSeals can be bolted in if anyone really wants to. That is the standard method for wooden boats. 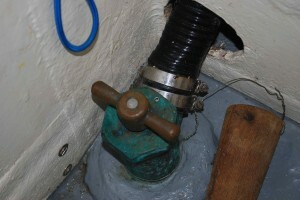 The flange is not drilled as standard as the vast majority are fitted to GRP boats. Unless they are badly corroded (by electrolysis? ), Reactions’s old valves should be able to be refurbished.